Making schnapps in Slovenia is a winter affair. My car thermometer read -11c as I pulled up at the small farm, somewhere in the distant hinterlands of Koroška. In rural Slovenia, the hills are alive with the scent of schnapps cooking. Ever since I was offered a small glass of the clear, strong, homemade spirit by my neighbour Jaka eleven years ago, I had been keen to see the schnapps making process for myself. Finally, a decade later, that day had come. I was joining Viktor, Marina and their two (now adult) children – Ana and Martin – (as well as their rather long dog – Robbie), in a nine-hour moonshine making mission. The day began a little after 9am with a spot of breakfast, which of course included a shot of schnapps, along with tasty cold cuts from the farm, finished off with dark, black Turkish coffee. The younger contingent of the cooking team – Ana and Martin – spoke excellent English so I was able to explore quite deeply into their lives and the process of the cook. But there were numerous periods throughout the day, where I was with only Viktor or Marina (or Robbie), which provided me with ample opportunity to practise my caveman Slovene. šnopc). And my hosts had been cooking for the last 10 days straight. The 2018 autumn had produced a particulary fruitful harvest, which meant they had weeks of mash to get through. Although back in autumn, during Making Schnapps Part 1, I had been plucking plums, today it was a batch of pear schnapps we were making. The mash had been sitting in a barrel fermenting through the winter. Now it was time to cook. Upon stepping into the barn where the cook was taking place, I was hit by the sweet scent of pear. The first part of the cook was filling the 100 litre still with pear mash. The steel and copper contraption was 40 years old Viktor told me, manufactured by a then Yugoslavian company that no longer existed. A wood fire was then lit below the copper cauldron, and we sat around the still, enjoying the heat and waiting. Viktor instructed me to feed the fire to ensure it burned hot and fast. A wheelbarrow of well-aged pine fuelled the burn, which popped and spat as it roared in the belly of the still. It took around an hour for the first drops of distillate to appear. For those who have forgotten their school chemistry lessons, let’s recap. Distillation is the process of separating (in this case) ethanol, from a mixture of liquids. The process works because alcohol has a lower boiling point than water. This means as the mash heats up, alcohol starts evaporating out of the mixture first. The vapour travels up the copper pipe and then down into the cooling coils of the still. These are kept cold by being immersed in a barrel of water, which was kept cool by pumping the water out through a pipe that sat in the snow, before returning back to the barrel. The cold sides of the coil cause the alcohol vapour to condense into a liquid again, and this then comes dripping out of the condenser pipe and is collected. The first cook produces something Victor called Meka Rakija. I was keen to sample the cloudy white liquid and found it to be very palatable. It had a sweet flavour with a tasty note of pear. I requested to capture some of this nectar and was duly given a 500ml Pepsi bottle which I filled. I later measured the alcohol content and found it to be a healthy 30%. We kept the fire crackling, and as the mash came up to temperature, the flow of the distillate increased, filling several buckets which were then pooled with previous batches. Before commencing the more delicate second cook – the still was emptied of its now alcohol-less mash, and given a thorough clean-down. I asked Viktor what happened to the steaming barrels of spent pear, wondering if perhaps the pigs would enjoy it. Apparently not. The animals won’t eat it so it ends up in a big compost in the forest. We retired back to the house for lunch before starting the second cook. A hearty meal of beef goulash and polenta was served. When I asked Marina – the lady of the house – if I could help with anything in the kitchen, she expressed surprise, explaining that men are rarely seen in that part of the house. Back to the now gleaming copper still, Viktor filled it with the proceeds of previous first cooks. The second cook is a much more careful and controlled stage. Ana and Marina showed me how to keep the fire small but as consistent as possible, burning just one or two small split logs at a time. In goes the proceeds of the first cook. Meka Rakija – a liquid around 30% in alcohol. “Everyone in the country had a job then; everyone had enough. But then there were many situations where they had five people doing a job that one person could do. Also – because Yugoslavia strictly controlled imports, it was hard to get certain products that weren’t manufactured inside the country. For example, we had to go to Austria just to get washing detergent and you were supposed to pay import duty if you brought it back into Yugoslavia. After a good hour, the first drops of liquid began to appear. Completely clear and colourless, Viktor explained that this was very strong, and for ‘external use only’. In other words – not for drinking. Here the language barrier here proved to be too much and I was unsure as to whether it was methanol (a much more toxic member of the alcohol family which can cause permanent blindness by destroying the optic nerve if drunk even in small quantities), or just very strong ethanol (common drinking alcohol). I noted that the first litre of the distillate was collected, bottled and measured (85% alc) but no futher testing was carried out on the rest of the batch. The only test performed was Viktor throwing a shot glass full on to the fire. Apparently, the ferocity of the ensuing flames, allowed him to gauge the alcohol make-up of the liquid. I assume that even if the rest of the distillate contains some methanol, when mixed with the entire batch, it’s not at a dangerous level. At least that’s what I hope, else my optic nerves are going to get destroyed. After the first litre of this potentially-optic-nerve-destroying liquid had been taken, Ana explained that we had to keep the spirit flowing from the still, at a low, steady rate. And this was gauged by the angle at which the liquid ran from the pipe. “The stream should fall exactly vertically” she explained. At first I was unsure how it could not fall vertically, but as the fire died down, I could see how the steam started to bend back under the pipe. And when more fuel was added, there was an initial spurt where the stream arced away from the pipe. I played with the fuel, trying to keep the perfect stream as instructed. Following a round of homemade pancakes, my hosts seemed satisfied that I was now a capable enough cook to keep the operation running. They duly left me to keep the fires burning, whilst they disappeared to milk the cows. At first I felt like Jesse from Breaking Bad when Walter White leaves him to cook his first batch of meth on his own. A pang of responsibly hit me. After all, this was part of their commercial farm operation. This cook was money. Was I going to mess the whole thing up and ruin the entire batch? Would Viktor (aka The Slovenian Heisenberg) ‘disappear’ me? I paid close attention to what I had learned; keep the flow coming gently. Stop when the liquid becomes milky. Don’t drink it all. As each 10 litre bucket came off, I measured the alcohol content, then added it to the main barrel. Each tier was lower in alcohol than the previous one; 75%, 65%, 40%, 30%. But when mixed together, the overall batch was still well over 60%. Saying that, we were using an alcoholmeter for the readings. This is a calibrated instrument that looks a bit like a thermometer and is designed to measure the amount of ethanol in a liquid, containing only ethanol and water. As there are numerous other products produced by the distillation process (methanol, oils and higher alcohols) I don’t think the readings we took could be completely accurate but did provide an approximate figure. As the cook entered its dying stages, Heisenberg returned and instructed me to feed up the fire up again. Squeezing out as much ethanol from the cook was the goal, and that required a roaring fire for the last few litres. For the final hour of the cook, we entered diminishing returns. More heat was required to get what was a weaker and weaker distillate, until finally, the output became a cloudy liquid. The cook was over. It was after 7pm when I placed the fruits of my labour into my car. Heisenberg seemed satisfied with the cook and had kindly given me two litres of pear schnapps, diluted down to 50% alcohol. It had been an interesting experience. I had learned much and acquired a new appreciation for the hours and energy that went into this fiery liquid, which is to Slovenia, what tea is to Britain; dolled out at any hour to guests. Finally, 12 years after my first taste of Slovenian schnapps, I had joined the cook. And na zdravje to that. In the interests of balance, to contrast my 10 Best Things About Living in Slovenia, I’ve compiled a ‘worst things about living in Slovenia’ too. No country is perfect, and having lived in six different nations so far, I’ve experienced the pros and cons of each. I’ll point out that when it comes to Slovenia, a) this list is far shorter than the best things list, b) most points are not unique to Slovenia, and c) this list presents somewhat of a ‘first world problems’ line-up, in that if these are the worst aspects of living in Slovenia, then overall – things are pretty good. And of course, this is just my personal experience of life in Slovenia. Please add your own thoughts and experiences in the comments. As someone trying to learn Slovene but unfamiliar with the family of Slavic tongues, there are several concepts which exist in the Slovenian language which are quite head-twisting for me. Though Slovenes are quick to cite the ‘dual plural’ as being the foreigner-proof aspect of their language – for me it’s the declensions (skloni) which I find most frustrating. This ongoing mental tripwire is what I call the ‘Slovene Skloni Matrix’; a giant table of word-ending modifications which intersects six cases, three genders, two types of plural and a single type of singular, (not to mention the different endings for adjectives and nouns), that must be memorised and applied in order to end your words correctly, depending on the context. In Slovene, even proper nouns are modified, thus my name can be: Sam, Sama, Samu, Samom, etc – depending on what’s being said. Damn you skloni – damn you all! I acknowledge that if I spent more time actually learning the grammar rules, rather than complaining about them, it probably wouldn’t be on this list. Too many Slovenian drivers have a terrible habit of straying from their lane on blind corners. Every time I drive to Breg, at least once during my journey (and normally several times), I will come around a corner to find an oncoming Slovenian driver with at least 50% of their car on my side of the road, forcing me to take evasive action. This also triggers my ire in the form of a lengthy horn blast and some ‘Get the hell over!’ gesturing. With this dangerous habit so common here, it’s little surprise to me that Slovenia is ranked in the bottom third of EU countries when it comes to road safety and has more than double the road deaths per million inhabitants, compared to the UK. What does surprise me though, is that Italy is not ranked even lower than Slovenia. Whilst driving from Barcelona to Slovenia (and back) during the Road Trip From Hell in 2017, the Italian drivers stood out for being by far the worst of the six countries that we drove through. It’s a strange and somewhat sad situation here, that Slovenians seem to have an unusually high frequency of neighbourly feuds and disputes; apparently, neighbourly envy is deep seated. Naj sosedu crkne krava, če je že sami nimamo. The longer version of the story goes something like this: there were three neighbours, each owning a cow. One day, the cow of the first neighbour dies. This makes the other two very happy. Then the cow of the second neighbour dies. This makes the last neighbour even happier still – neither of his neighbours has a cow, yet he still does! But then he realises that his now cow-less neighbours will come begging for milk, so he then wishes for his own cow to die too, so that he doesn’t have to give them anything. The rather sad meaning of the story is that Slovenians would rather see their own cow die, before having to share anything with their neighbours. Now, I must point out that most of my neighbours have been very generous and very sharing. Despite hearing several stories from Slovenian friends and colleagues about their neighbourly problems, I took the whole ‘hate thy neighbour’ trait, as an exaggeration. That was until I myself started having my own problems with one of my neighbours, which now makes the cow story sound quite accurate. Though my dispute involves neither dead cows nor any calls for milk, I have personally experienced the unfortunate depths to which neighbourly relations can fall, over the silliest and smallest things. I’ll again say that all my other neighbours have been lovey, helpful and pleasant people, but if this really is as common as I’m led to believe from my Slovene friends, then for me it’s the most (and perhaps only) ugly side of Slovenia that I’ve so far experienced, in what is otherwise a very pleasant place. As with much of the rest of continental Europe, table service is the norm here and going to the bar (like in the UK) is generally not the done thing. This is good. I like not having to waste my time queuing, waving a tenner at the bartender hoping he’s going to serve me next rather than the guy who just barged in front of me. However, in more than half of the places I go to, I find that although the table service upon first seating yourself is quite prompt, follow up attention is much less so. Normally you need to flag down the server, rather than getting a proactive ‘Would you like another drink/something else/ the bill?’ attentiveness. I reiterate, there are some places with great service but there’s definitely room for improvement in the many of cafes and bars I’ve visited. It’s not unique to Slovenia by any stretch, but I’ve found it even more difficult than the UK to get tradesmen here to actually turn up when they say they’re going to turn up. I’ve had numerous dealings with various trades over the years, and more often then not, they have not appeared when they said they would. This has been especially frustrating when I have driven two hours to Koroška on the agreed date just to meet with a tradesman, only for a no show, then radio silence, with my calls and texts going unanswered. This has led to my default position being to expect them not to appear at the agreed time and date, and the acceptance that things always take longer than I want and require more pestering than I’m used to. So – there it is. I suspect this list might change over the years; some things may improve (my grasp of Slovene grammar for example!) and new items may appear. I make no complaints about life overall here – but there’s always room for improvment. Do you agree with the list? Post a comment below. I’ve been visiting Slovenia since 2007 and living here since 2017. Slovenia is the sixth country and on one of three continents I have lived, so I have some perspective on life in other parts of the world. In the interest of balance, I also wrote a ‘5 Worst Things About Living In Slovenia’ article too. That was however, a considerably shorter piece, and one that is vastly outweighed by the positive aspects of life here. I have lived in Europe, North America and Asia (see: For Fukui’s Sake: Two Years in Rural Japan), yet no country I have visited is as consistently beautiful as Slovenia. It’s the type of beauty that constantly punches me in the face and demands my attention. And it’s not just a handful of hotspots either. Yes, Lake Bled and the old centre of Ljubljana and Piran are the pretty pin-ups of the country, but almost everywhere, from the spikey mountains of the Julian Alps, to the vineyards of the south, to the terracotta towns of the coast, to the villages of the Slovenian hinterlands, makes my heart go boom. For me, Slovenia has an almost perfect climate. If you like snow, you’ll enjoy Slovenia’s proper, cold, snowy winters. There are ski areas dotted all around the country including Krvavec which is just 30 mins from Ljubljana, plus many more a little further afield. Slovenian summers are hot, meaning lazy days cooling off on the coast or by one of the lakes or aquamarine rivers. Spring and autumn are ideal inbetweeners; warm days, and crisp evenings. Plus Slovenia gets some really good, heavy thunderstorms, and everyone loves a good storm – right? Most Slovenians of a certain age speak English as a second language to a level only rivalled by Scandinavians. Indeed, it would not be possible for me to work for a Slovenian company, were it not for my colleagues’ impressive ability to speak English so fluently. This is however, a double-edged sword; if you’re trying to learn Slovenian, (which I am), practice at speaking the language on a day-to-day basis can be in short supply. In fact, many Slovenians are tri-lingual, often having a working knowledge of German or Italian in addition to English and their mother tongue. Slovenia prefers to be deemed to be in ‘central’ rather than ‘eastern’ Europe and for good reason. Geographically, it’s much further west than many might realise, bordering Italy and Austria, as well as Hungary and Croatia. Ljubljana is only 2.5 hours from Venice, 3.5h from Vienna and 2hrs from Zagreb. Politically and culturally too, Slovenia seems to have more in common with western Europe than the (former) eastern bloc, and is modern, developed and advanced. Though not completely non-existent, crime rates are very low in Slovenia. It’s a country where kids still play in the streets without parental-fear, you can walk most anywhere at any time of day, and people often leave their cars unlocked when in the shops. 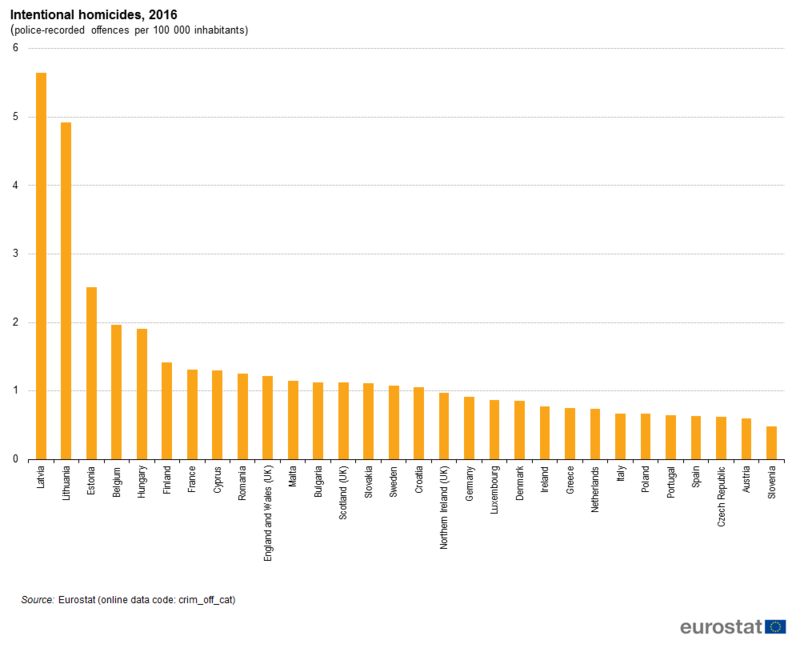 Statistically, murder rates in Slovenia are the lowest in the EU. Slovenia has done well to preserve much of its natural beauty and most of the population are respectful of their environment. Litter levels are low and recycling provision is high, and it’s ranked the 3rd most forested country in the Europe. Slovenes love the great outdoors and spend plenty of time hiking, skiing, kayaking, paragliding, rock climbing etc etc. On a more day-to-day basis, I have been particularly impressed with Ljubljana’s provision of bike lanes. Almost all major roads, and many minor ones, have a designated bike lane, and many even have a bike lane completely separated from the road. This is vastly superior to what I’m used to in the UK and enables me to cycle around much of Ljubljana, without having to worry about getting run down by a car, and encourages the population to use their bike. There are lots of interesting start-ups and several established tech companies in Slovenia. A high level of developer talent, combined with a high level of English and a pedigree of programming has led to a petite, yet healthy tech-scene. Some Slovenians have historically sought employment in Germany, the UK or elsewhere, but the growth of Slovenia’s tech scene (especially blockchain and ‘crypto’) is also drawing foreigners to move here. In contrast to #7, sometimes living in Slovenia feels like a welcome step back in time. Many things that UK hipsters deem ‘artisanal’ or ‘craft’ and pay big bucks for back home, are just part of everyday life here. Growing your own vegetables or butchering your own meat and making your own sausages for example. Or making your own schnapps, cider or wine; many Slovenes have hobby vineyards with little wine cottages. These are all common aspects of Slovene life, which are less common now (or non-existent) in the UK, outside the said expensive ‘artisan’ arena. I do wonder however, if the next generation of Slovenian teenagers will continue with such a way of life, when it’s often easier, cheaper and quicker to buy such supplies from the local supermarket, rather than spend two days butchering a pig and making your own sausages, or tending your vineyard every weekend . I once joined my friends Rok and Ivo at their dad’s wine cottage during the grape harvest. They complained bitterly that they had to put in a huge amount of work throughout the year in order to make wine which was inferior and in the end, more expensive, than what they could buy in the supermarket. Though I could see their point, I love this aspect to life here, and I hope Slovenes will keep it alive for a long time to come. My overriding experience, having been visiting Slovenia since 2007 and living here since 2017, is that 99% of Slovenes that I have interacted with have been kind, friendly, welcoming and helpful. I have had only a couple of bad experiences (see: Battling Bureaucracy: A Taste of Red Tape in Slovenia), and most Slovenes have gone out of their way to assist me when I’ve been in need. Which has been quite often (see: Barcelona to Breg: Road trip from hell | Part 2). I often think that a Slovene living in the UK would not have experienced as much kindness from the Brits, as I have here, especially considering I am no where near fluent in Slovenian (though I am learning: see: Struggles with Slovene: 6 Months of learning Slovenian). Slovenians on the whole enjoy a high quality of life and there seems to be, overall, a good level of equality across the country. Saying this, I have found that Slovenians are a little over-obsessed with salaries. I often hear them complain that salaries in Switzerland, or Germany or the UK are so much higher than in Slovenia. Whilst it’s true that the average salaries are higher in those countries, I feel Slovenes sometimes overlook the much higher living costs of those countries, and are therefore missing the bigger picture: the actual quality of life in their own country. Beach time, mountain skiing, great weather, good quality food and great wine, a clean, green and safe country, are all aspects of Slovenian life accessible to the average Slovene, which can’t be said for the UK. Do you agree with my list? What do you like about living in Slovenia?